Over-all place: Good and is well-lighted. If you can’t get over on how Filipino dishes or say “Cebuano” cuisine would salivate your red chops and if you want “UNLIMITED” rice for lunch or dinner, let loose on your diet plans, have a fattening dose for just one day! 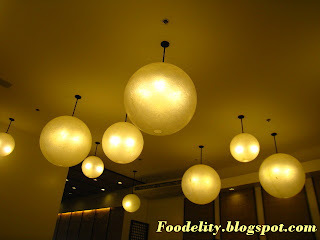 Try Chika-an sa Cebu restaurant. 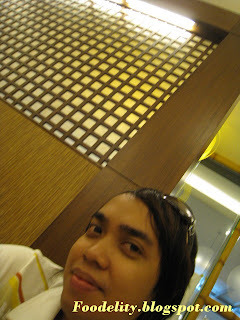 A good friend left our dear Philippines for a work experience in the Lion City, Singapore last August 19, 2008. And as a treat, I invited her for a luncheon date. 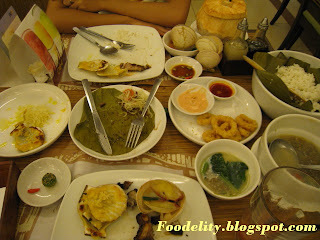 For her to hardly forget how Filipino cuisine would haunt her appetite when she’s far away home, we dined at Chika-an. The food experience is worth missing as she told me. I’m sure, her taste buds would probably be in different tune in another part of Asia right now but the Chika-an encounter would be notable. 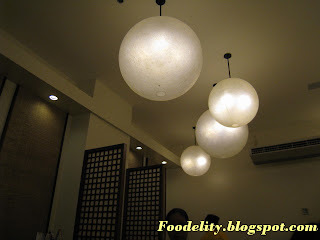 The dining place is built with simplicity and the illumination with the presence of those decorative glowing balls on the ceiling adds harmony to the area. The walls are quite bare with no presence of work of art. 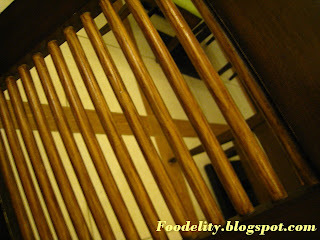 The wooden window trellis and the crafted bamboo poles brought the Filipino aura of a restaurant even though it’s located at the modish nook of the mall. The aisle is quite unsetting in one of the area. There is little space for you to toddle a few steps to your table. In terms of space, the interior may not be well-designed. I guess, it needs a minor uplift on how tables and chairs be arranged. Their branch in Salinas drive is rather perfect if accommodation is to be considered. The venue and my dining experience in that branch are worthwhile. So, I might be quite bias to it. After a series of prima shopping and calories-burning boutique stroll, we kicked-off a splendid menu on our table right before our eyes! It’s what we call, “Fiesta” by two! LOL! 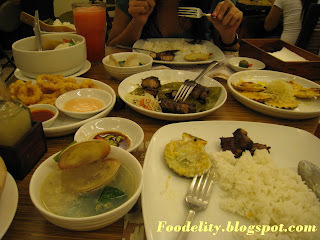 As we are so hungry, our stomachs deserved a sumptuous meal. Our lunch picks are a bowl of clam soup, grilled spareribs, plates of calamares and baked scallops, the “unlimited” rice, watermelon shake and fresh buko. * Clam soup- it’s definitely good for two. 5 big clams are boiled and seasoned to its soupy taste. It contains celeries, red bell peppers, chinese cabbage, tomatoes, and cracked egg. As to my flavor meter, it may not be the best soup we ordered but it will for sure quite revel in your mouth. 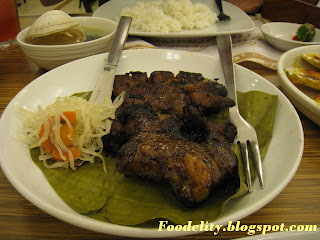 * Grilled spareribs- we can’t put aside meat! LOL! We need to eat a variety of food! A dose of carcinogenic grilled meat may not be harmful at all. Hahahaha. Grill it for us! Good thing, it is so tender when I slide my cutting knife to it. A plus point for Chika-an. 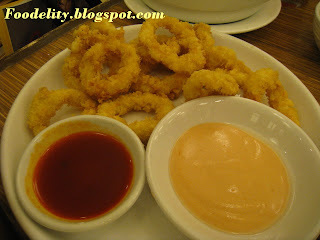 * Plate of calamares- these are squid rings dredge in flour (mixed with egg whites) and are served with garlic mayonnaise or their dipping sauce as an appetizer. So far, the taste is terrific! The squid rings are soft to chew. 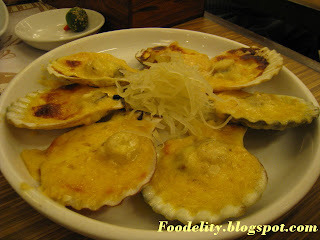 * Baked scallops- these are baked in an oven and are topped with a mixture of butter, garlic and lemon. They have a very rich butterrrrrryyy-flavored one! I like it more cheese though than butter. But for me, a taste of two is enough to satisfy me. It’s just so flavorful. * Unlimited rice- if you want more carbo, go to Chika-an! 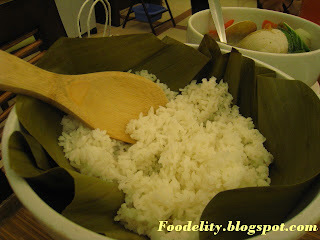 No scarcity of rice in that restaurant! Grab a seat and just choose your menu and unlimited rice is yours to enjoy! 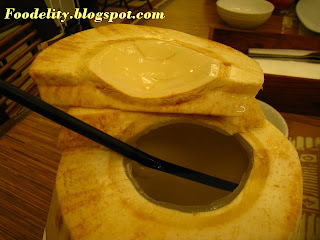 * Fresh Buko- it’s not well-chilled compared to Gerry’s Grill’s. I’d rather had a can of diet coke then with tons of ice in a glass! I would definitely not order it again. I might choose and try their watermelon shake which my friend liked. We spent less than Php 1,000 only. Here’s the price as of August 19, 2008 on the menus that we ordered. Just call them or visit the place for an updated price list. It might change without prior notice. LOL! I guess, when it comes to food, we have to be a bit extravagant about it. Duh, spend the money with quality food. Note: Chika-an still have other menus for you to lavish on. At least you have an idea on how they are priced. Planning for a date, make sure you are on a budget! Hope I’m at help. 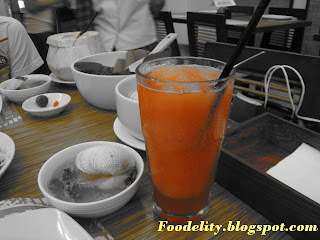 the watermelon shake i'm sure u'll love. smooth ang ice so quite nice to drink. love the soup. 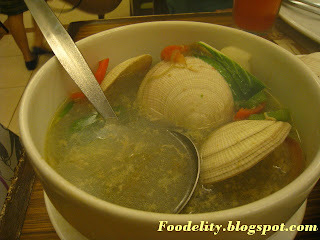 clam soup always make my mouth water. 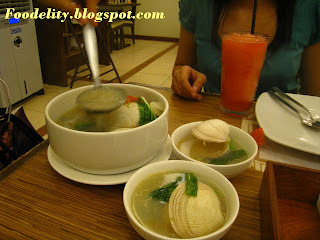 it's a treat i'll never forget especially that all the food here isn't as good a pinoy dishes! Hi Kat! Try to find their Singaporean Curry. I have tasted one at Big Bys. Hope that's how it taste in SG! Hehehe... Missed the flavor. I'm sure you won't forget. I love Bigby's!!! Tried their Manhattan when I stopped for lunch at SM Bacolod and had enough left over for a snack later that afternoon! The beef was pure heaven, and the french fries were nothing short of terrific, not processed like the ones that some fast food chains serve. Yum!!! I totally agree with you, joselee. I will not miss ordering it everytime I visit BiGBys! 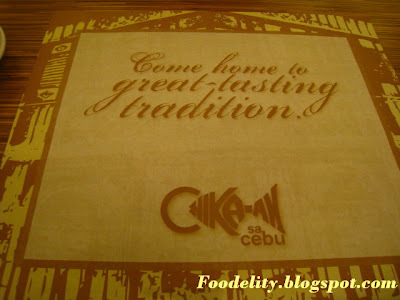 Chika-an is one of my favorite cousine in Cebu. The prices of their food is so affordable.